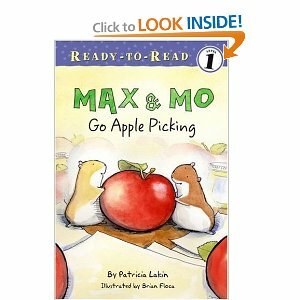 Last week Bria checked out a book about 2 hamsters named Max and Mo. While attempting to find apples to eat they made some apple prints with paint. The girls immediately wanted to try! There are actual instructions in the back of the book, but I figured it was surely straight forward enough I could figure it out. Maybe I should have read the instructions because our prints didn't turn out nearly as nice as their pictures. We started with 2 apples. One we sliced across the center (horizontal) and one we sliced down the middle (vertical). After putting on old shirts I let the girls each choose some paint for the apples. We decided to try multiple colors on the same plate. Then we just put the apple in the paint and on to the paper. The girls had trouble getting enough paint in the middle of the apple, so some just looked like outlines. For some reason they were not to enthusiastic about being messy (very strange for them), so they didn't paint long. They even tried to use paper towels to hold their apples which just slipped out. In the past we have also done this with peppers (when cut horizontally they look like clovers).